Dr. Jerry Kozai, Alta Bates Summit CEO, pledges his support to an Oakland initiative to help move homeless people from encampments into temporary shelters. People that live and work in Oakland know that the number of homeless encampments in the city has been on the rise for several years. Between 2015 and 2017, the number of unsheltered residents in Oakland has increased by 26 percent. To help work on this crisis, Sutter Health’s Alta Bates Summit Medical Center has partnered with the City of Oakland to support the city’s initiative to help move homeless people from encampments into temporary shelters. 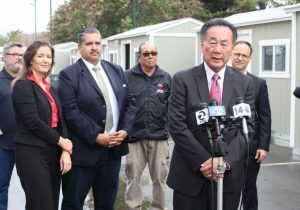 Over the last 10 months, the city has opened three Tuff Shed Shelter Community Cabin sites that provide shelter to Oakland’s long-term homeless population with social services connecting clients to health services, public benefits and other resources. As a not-for-profit health care network, Sutter Health strives to make the community healthier—this includes doing our part to create a sustainable environment. From conservation and recycling to green construction, Sutter Health finds and implements eco-friendly practices that nurture our communities and allow us to continue providing the high-quality care and exceptional service our patients expect and deserve. Health care facilities by their very nature use a great deal of natural resources. Over the past several years, these facilities have been able to implement changes thanks to a focus on energy efficiency and conservation within the industry. Now, many new hospitals incorporate sustainable design into their very early planning stages. That means designing for energy efficiency, reducing water consumption, improving indoor air quality, making better building material choices and reducing the overall environmental impact of health care operations.